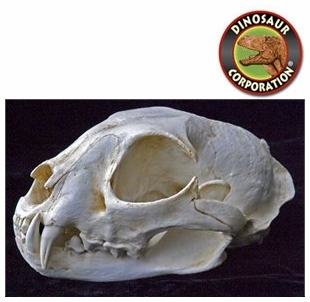 Eurasian Lynx skull replica is cast from original specimen. The Eurasian lynx (Lynx lynx) is a medium-sized cat native to European and Siberian forests, Central Asia and East Asia. It is also known as the European Lynx, Common Lynx, the Northern Lynx, and the Siberian or Russian Lynx. While its conservation status has been classified as "Least Concern", populations of Eurasian Lynx have been reduced or extirpated from Western Europe, where it is now being reintroduced. The Eurasian Lynx is the largest lynx species, ranging in length from 80 to 130 cm (31 to 51 in) and standing about 60�75 cm (24�30 in) at the shoulder. The tail measures 11 to 24.5 cm (4.3 to 9.6 in) in length. Males usually weigh from 18 to 30 kg (40 to 66 lb) and females weigh 8 to 21 kg (18 to 46 lb).